Well it’s here…. A new year and a new chance to make this one the best ever. What changes or strategy do you have in place to make this year better than the last, relationally, spiritually, professionally? If the definition of insanity is doing the same thing over and over expecting different results, doesn’t it make sense to shake up your daily routine for the best chance at real change? 14 years ago, I was a single dad raising my 6 and 9 year-old daughters on my own. Between a hectic work schedule and my responsibilities as a father I barely had time to fit everything in, let alone time for myself. I knew something had to change and the only reasonable solution was to add more hours to my day. I resolved to start getting up every morning at 5am to pray, journal, exercise and start working before the girls woke up and the “real” day started. I’m not going to lie, I liked sleeping in as much as anyone, but after a week of this new routine I was hooked! Now instead of trying to keep up with my load I was 2 hours ahead of it and ready to pounce while my colleagues were having their first cup of joe. Friends and family look at me sideways when I tell them I start my day at 5am but it’s the greatest life hack I’ve ever implemented. I’ve heard all of the excuses, “I’m not a ‘morning person’”, “I like to stay up late and watch TV”, “I require at least 10 hours of sleep” or my personal favorite “my kids don’t go to bed until 10 (really?)”. Look, real growth and change comes with a price, the good news is that once this becomes part of your routine it will not feel like a price, but rather a reward. If you’re anything like me you will be more productive during the “filet” of the day (a term I learned from a former boss that means 10am to 2pm), you will prioritize time for personal growth and you will likely sleep better and harder. Do you think these life changes could lead you to a better year personally and professionally in 2018? 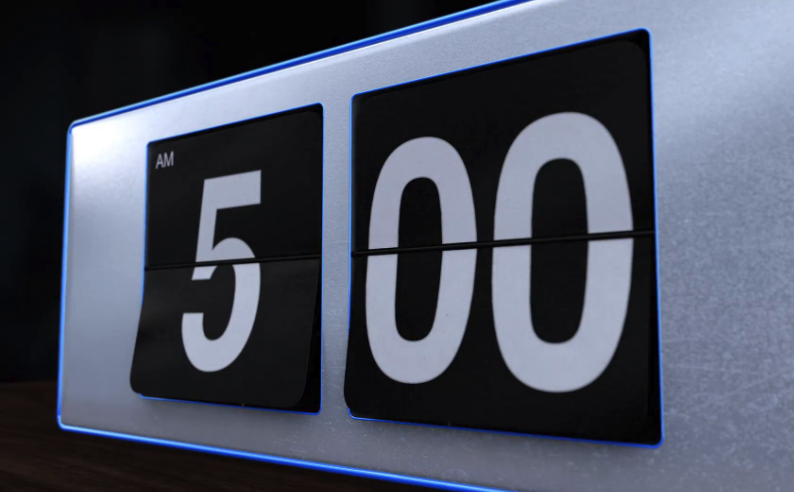 Here are a couple (obvious) tips for people that struggle with the early alarm. Get in bed earlier on weekdays. Strive to be in bed by 8:30, read or watch TV and be asleep by 9:30. There’s nothing worth watching on TV after that any way. Stay up late and party on the weekends if you want! Plan your morning the night before. You will not get out of bed if you don’t have a plan or something to accomplish (why would you?) Pre-make the coffee, exercise clothes together, bible or journal plan in place etc. Don’t try “weening” your alarm back to 5am. This only allows room for excuses and lessens your chances of making it to 5am. Just rip the band aid off and set it for 5am and get out of bed immediately without hitting snooze. Encourage your spouse, neighbor or friend to start this routine with you. Everything is easier with a buddy to do it with you. The chances of 2 people succeeding are better than one because you will rely on and encourage each other. Warning, one side effect of this new routine could be a stronger, healthier marriage, just ask me. What do you have to lose? Shake things up this year and try a new daily routine! I truly hope this suggestion/challenge is as transformative in your life as it has been in mine. Happy New Year!